Remember when you were a first year in undergrad? Maybe you were like me and you’d get butterflies as you thought about what the next 4 years would look like. You may have wondered how you’d make the best of them as you built your course lists and learned how not to get lost on your way to class. But did you ever think that you’d get a chance to do research? To help plan, run, present, and write about your projects? Well I sure didn’t – that is, not until I met Dr. Jiaying Zhao. You see, before I had any idea of how to get involved in research I was looking for ways to combine my two greatest passions: psychology and geography. I was majoring in both and knew that I had a link between the two – while in psychology I was interested in how the environment impacts people, in geography I was interested in how people impact the environment – I just didn’t know where to start. It was around then that I heard about a new professor in the psychology department who shared my interests. When I first met Dr. Zhao, I had only the hope that she would help point me in the right direction. Little did I know that we’d be working on projects together for the next 2 terms, or that I’d be going to conferences in Florida and San Francisco to present our work. We started off with a study that was the perfect blend of my two majors; we wanted to know how well-being can be influenced by the environment. For example, if you’re walking from the SUB to the Kenny building, how does the way you feel fluctuate as you move from the first location to the other? To find out, we picked four spots along University Boulevard, surveyed people, and found that they were a lot happier at the water fountain on Main Mall than they were at the bus loop just 300 meters away. Not only that, but I got to present our findings at the APS convention in San Francisco. It was beyond exciting to display my poster (which you can find here or see below) at such a huge venue. But what was equally exciting was something else that happened earlier in the school year. While working on our well-being study, I got to get involved in one of Dr. Zhao’s cognitive projects. Using color pairs of dots and lines, we found that our representation of an object can change when we learn that it reliably co-occurs with another object. So if I learn that a red dot always appears to the left of a blue dot on a screen, I actually start to perceive the red as being closer to the blue. To tell you the truth, cognition is completely different from anything I thought I’d be studying. I’m sure you can imagine how bewildered I was to give a talk on our findings at the Vision Science Society’s annual meeting in Florida. Despite my reservations, the whole experience left me fascinated. I’m even looking for ways to combine my new found interest in cognition to my longstanding concern for the environment. If there’s any one thing I’ve learned from these experiences, it’s that getting involved in something you care about is the best way of getting the most out of your education. You not only get to explore your own interests, but you find new ones and discover what you would or wouldn’t want to do with your degree. I think us undergrads are capable of a lot more than we think, but we just don’t always know what opportunities are out there. You’ll be surprised at where you can go when you give your endeavors your best. Mine brought me here, where will yours take you? 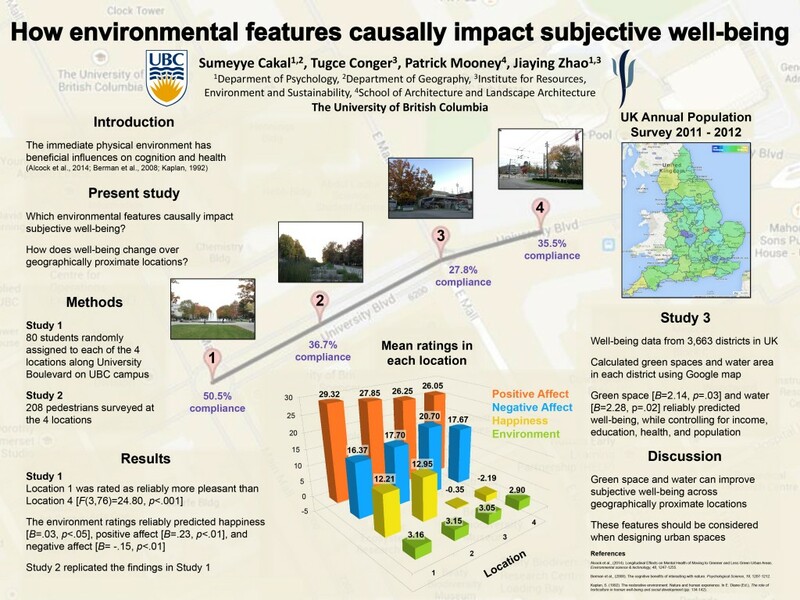 Sumeyye Cakal is a recent graduate of UBC with a BA in Psychology and Geography (Environment & Sustainability). Her interests lie in exploring the bi-directional relationship between humans and the environment with a particular focus on sustainability. She is currently a lab manager in the Zhao Lab and is continuing her work with Dr. Zhao on well-being and on resource perception. This entry was posted in Research, Undergraduate and tagged Poster on July 2, 2014 by Bonnie Vockeroth.